About 4 years ago we began the relocation and remodel of our kitchen. The original kitchen was a narrow galley style kitchen, too small for more than one person at a time. Adjacent to the kitchen was an odd shaped unused room that was quite large so that is where the new kitchen would be located. After removing a pair of windows and an oddly placed door and installing an atrium door and some re-siding, work began indoors. The new kitchen space was demolished. New electrical, plumbing, drywall, and flooring installed. We also installed prefinished Western Red Cedar planks for the new kitchen ceiling. The appliances and old cabinets were moved from the old kitchen into the new space. This left the old kitchen empty and ready for remodel. The old kitchen utilized soffits along the ceiling against which the cabinets were installed. The original 8’ ceiling in the old kitchen was corrupted with plumbing pipes from prior whole house re-plumbing job (before my time). 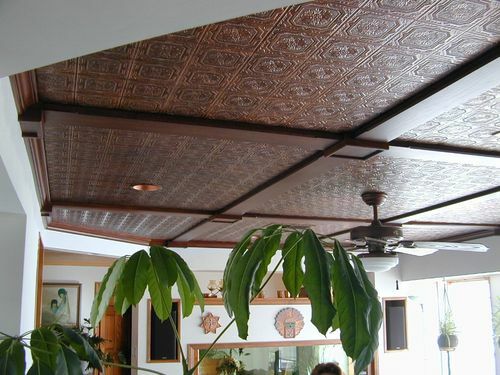 A drop ceiling grid that concealed florescent lighting was torn out and replaced with a drop ceiling of our own design. 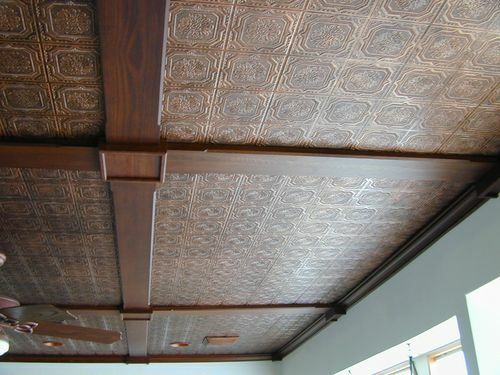 The coffered drop ceiling consists of two layers of poplar, 2-1/2” base layer over which is a 1-1/2” layer, both milled with a 3/8” cove. The perimeter of the ceiling opening, between the soffits and a 9” wide poplar board in the center make up the structural supports. The center wide poplar board is re-enforced with 1×4 poplar set on edge to which the 2-layer trim is attached. A pair of recessed LED light fixtures was installed in the center support. This created two long open spans. The long open spans were divided into three space. A bridge that divides the span were made from 1×4 poplar with the layered trim attached. These bridges are free floating and set in notches left in the wall and center support structure. Some left-over tongue and groove cedar planks formed in-fill panels. The cedar planks were fit together and a pair of battens screwed to the backside of the planks keep the panel together. The planks set in a rabbet created when the support structure and the bridges were constructed. The poplar was paint a semi-gloss white and the cedar panels dropped in place. We went on to add a walk-in pantry, a coffee station and a china hutch in the old kitchen space. You have posted a lot of good work here, congratulations on a job well done. Very creative thinking! Nicely done. That’s a lot of work! The profiling really adds to the finished project.